How can we get people to stop smoking. Many cigarette packets have warnings on them such as ‘smoking kills’, in fact this is a legal requirement in some countries. Some cigarette packets have images of the effects of smoking. One of the proposed ways that people can be dissuaded from partaking in unhealthy behaviours is through fear appeals, these are campaigns that try to invoke fear through showing the effects of the unhealthy behaviours. 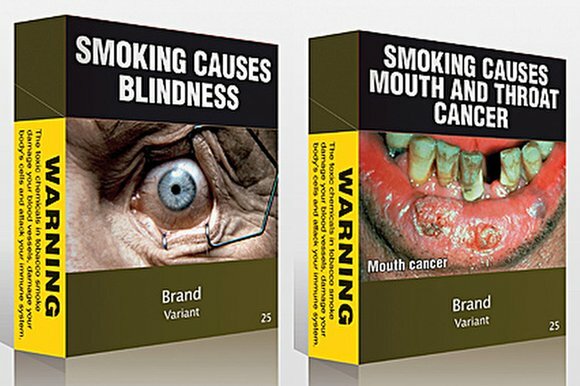 A longitudinal study over 2 ½ years by Hammond (2003) showed that pictorial warnings on cigarette packets in Canada had a greater impact on reducing smoking than written warnings on packets in the UK. An example of a graphic fear-arousing picture on cigarette packets. Janis and Feshbach (1953) – investigated the effect of fear arousal on dental hygiene Their research shows how important it is to get the ‘fear factor’ just right: too much fear just make people switch off, while with too little fear the impact is lost. To investigate the consequences on emotions and behaviour of fear appeals in communications. The participants were shown fear-arousing material. The researchers collected data by a series of questionnaires on emotional reactions and changes in dental practices. 200 students in total, with 50 in each group. Pictures and descriptions of diseased mouths, including explanations about the pain of tooth decay and gum disease and awful consequences like cancer and blindness. Similar pictures and descriptions as group one, but they were much less disturbing and dramatic. Group Three were given a lecture about teeth and cavities, but without referring to very serious consequences and using diagrams and x-rays rather than emotive pictures. This was the minimal fear arousal condition. Group Four was the control group and they were given a lecture of the same length as the other conditions (15 minutes), but this group was given a lecture on the structure and functioning of the human eye. Immediately after the lecture a questionnaire was given asking for the participant’s emotional reactions to the lecture. One week later a follow-up questionnaire asked about longer term effects of the lecture. The amount of knowledge on dental hygiene did not differ between the three experimental groups, so all the lectures had successfully taught the material. The strong fear-appeal lecture was generally seen in a more positive light, but more participants said they disliked something in the talk, and that the slides were too unpleasant. The strong fear-appeal group showed a new increase in conformity to dental hygiene of 8%. The net increase in the moderate fear group was 22%. The increase in the minimal fear group was 36%. The control group showed 0% change. The strong fear appeal created the most worry in the students and was rated as more interesting. However, the overall effectiveness of a health promotion campaign is likely to be reduced by the use of strong fear appeal, as it produced the least change in behaviour. Fear appeals can be helpful in changing behaviours, but it is important that the level of fear is tailored to each audience. + Useful the study is useful for increasing health behaviours in individuals, fear arousal may not be the most effective way of promoting healthy living. – Ethnocentrism – the sample consisted of first year students only, therefore we can argue that it is difficult to generalise the results to wider populations. – Generalisability is low because we cannot easily generalise the results to other fear appeals for example of smoking or drink driving.